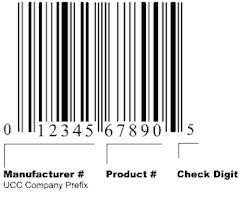 The Universal Product Code became a supermarket industry standard in 1973. The first UPC was put on chewing gum in the early 1970s. The reason we were told they did this was tracking. It would be a few years before cashiers would begin scanning prices. Gotta love the UPC's. While the cashier spends 5+ minutes trying to scan an item that cost $1.27 - in the old day you would enter 1 2 7 and pull the crank handle and on to next item. People were under the misconception that UPC scanning was for increased speed and efficiency. Nope - it was strictly for improving inventory tracking. Until about 35 years ago merchandise was individually priced. Tin cans were usually marked with a number in a circle in blue ink. It was easily rubbed off for a price change. (No one ever thought of rubbing it off and lying about the price.) Cashiers had to put in each price manually (there was no scanning). When it was announced that they would quit putting prices on everything (relying then on UPC marks) consumers were outraged.